Home » Flag News » Veteran Runs Across America Honoring One Life, One Flag, One Mile. Veteran Runs Across America Honoring One Life, One Flag, One Mile. Veterans Day always comes around and as flag people we wonder what stories are going to come out of the wood-work. We found this story and felt compelled to respond: Veterans Day story. This story deserves the national press it has received over the past few days. We run from flagpole to flagpole helping restore broken down flagpoles so flag flying becomes a joy again. We've run 90 miles over 3 days, but we've never come close to this. 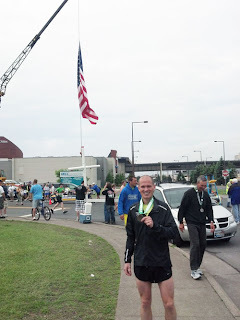 Mike Eherdt began in 2010 running across the country. He completed 4,514 miles, Honoring 4,514 Service Members lost in Iraq. From that day, May 1st, 2010, he started Project America Run. While we run to help flag flyers fly flags and hear their flag stories, Mike runs creating a flag story of his own. The vitality this creates for Mike is seen in the videos, articles, and pictures of his epic journey. Yesterday marked the end of his second epic journey. Running 2,140 miles, planting 2,140 flags, and honoring 2,140 lives taken in Afghanistan. Each stick flag has been tagged with the name of a Soldier or Marine. These hang off the staff just below the flag. What I found interesting was Mike's acknowledgement of the invisible wall he had created planting a Veterans Cemetery Stick Flag every mile. This wall doesn't represent separation, but remembrance. Like the walls of a house, this invisible wall represents the foundation of our country. First off all, maybe we are not that crazy. But secondly, Mike has carved out a path, showing others, one way to honor people who make our prosperity possible. The amount of preparation and forethought to be able to make this journey must in itself be a massive undertaking. Even more overwhelming are the responses people have when they join Mike. Watch here. Someday, We hope our paths meet, out there on the road, where we both run one mile at a time.